The Libyan National Army (LNA) on Sunday conducted airstrikes as part of its deadly military offensive towards Tripoli which aims to bring the country "back to the international community" despite western condemnation, a spokesman for the rebel group told Euronews. 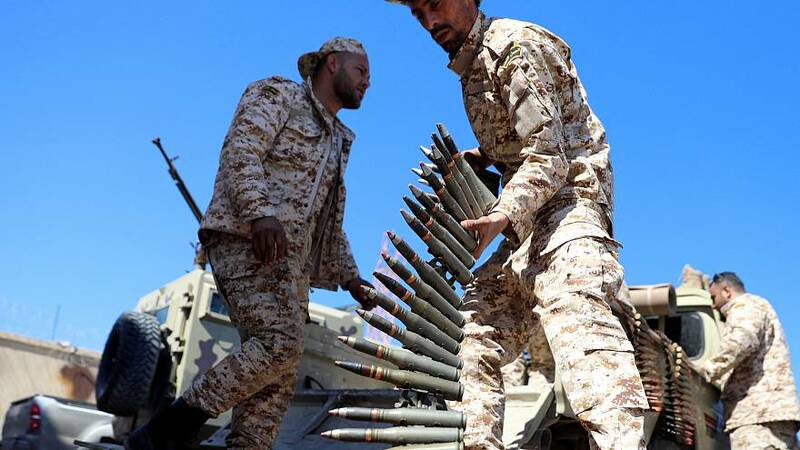 The eastern Libyan forces, led by Field Marshall Khalifa Haftar, launched a military offensive on April 4 to take the country's capital, Tripoli, held by the United Nations-backed Government of National Accord (GNA). The House of Representatives, based in the east have fought the GNA for control of the north-African country since the 2011 overthrow of dictator Muammar Gaddafi. The eastern government are an elected entity and the LNA support them. "Our troops' advance is going well, as we strengthened our quick and successful military gains," Haftar military spokesman, General Ahmed Mismari, told Euronews in an exclusive interview on Sunday. "Our forces launched the first airstrikes on three positions. Two of them were aimed at supporting the advance of land forces. The third airstrike targeted artillery positions some 60 km west of El Azizia (about 40 km southwest of Tripoli)," he added. He argued that the battle for Tripoli "was specifically launched to defend civilians, to defend the Libyan people, to defend our country resources, for the dignity of Libya." The GNA's Health Ministry said on Monday that at least 25 people have so far died in the fighting. One of the dead is believed to be a member of the Red Crescent's medical staff. According to the UN, the escalation of violence has also caused the displacement of more than 2,800 people. The organisation renewed its call for a temporary humanitarian truce on Monday to "allow for the provision of emergency services and the voluntary passage of civilians, including those wounded, from areas of conflict." A call for a two-hour truce on Sunday went ignored. US Secretary of State Mike Pompeo said on Sunday that Washington has "made clear that we oppose the military offensive by Khalifa Haftar's forces and urge the immediate halt to these military operations against the Libyan Capital." Britain's Foreign Minister Jeremy Hunt said there was "no justification for LNA move on Tripoli" while the European Union's top diplomat, Federica Mogherini, described the situation as "increasingly worrying" upon arriving at a meeting of the EU's Foreign Affairs Council on Monday. "I believe the challenge is now for different Libyan factions and leaders to overcome personal interests and serve the Libyan people that want to turn the page, and find a compromise and a solution," she added. But Mismari rejected such criticism, telling Euronews that this "campaign is aimed at bringing Libya back to the international community." "It is in the public interest so that Libya enjoys its natural position and becomes a good and positive country instead of being a land that exports terror to all countries." "European countries fear for civilians safety but I can assure you that our first concern is the civilians and humanitarian considerations," he argued. A UN-backed National Conference, gathering members from the GNA and LNA, to discuss ways to break the political impasse and draw up a road map for elections had been scheduled for April 14-16.